Kirk (foot) said Wednesday that he expects to be fully healthy by the end of February. Kirk (foot) expects to be healthy by the start of OTAs in May, Bob McManaman of The Arizona Republic reports. "My recovery is going well and I'm on the road to being 100 percent here in the next couple of weeks," Kirk said. "I'll be 100 percent by OTAs, for sure." Kirk suffered a broken foot and will be placed on injured reserve, Kyle Odegard of the Cardinals' official site reports. Kirk reeled in three of eight passes for 54 yards and took his sole carry for 23 yards during Sunday's 20-17 win at Green Bay. Kirk caught four of six targets for 41 yards during Sunday's 45-10 loss to the Chargers. Analysis: Kirk led the team in targets and catches while contributing to nearly half of Josh Rosen's passing production on the day. Unfortunately, the signal caller finished with just over 100 passing yards on the day, limiting Kirk's potential to produce. He's totaled a respectable 536 receiving yards to this point in his rookie season, but efficiency and consistency have been hard to come by. He'll look to bounce back next Sunday against the Packers. Kirk hauled in three of four targets for 77 yards, including a 59-yard touchdown during Sunday's 23-21 loss to Oakland. Kirk caught just two of six targets, amounting eight yards during Sunday's 26-14 loss to the Chiefs. Kirk caught three of seven targets for 42 yards and a touchdown during Sunday's 18-15 win over the 49ers. 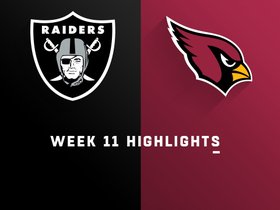 Kirk brought in three of six targets for 57 yards in the Cardinals' 45-10 loss to the Broncos on Thursday. Kirk caught six of seven targets for 77 yards during Sunday's 27-17 loss to the Vikings. Kirk caught three of four targets for 85 yards and a touchdown in Sunday's 28-18 win at San Francisco. Analysis: Kirk opened the scoring for Arizona with a 75-yard touchdown on its first play from scrimmage. He was quiet from that point on, however, catching just two more passes for 10 yards. Rookie quarterback Josh Rosen struggled overall Sunday, completing only 10 of 25 passes for 170 yards, but Kirk easily led the Cardinals in all receiving categories and has shown a good rapport with Rosen. In Week 6, Kirk will face the Vikings. Kirk hauled in four of five passes for 28 yards and added a seven-yard run during Sunday's 20-17 defeat to the Seahawks. Analysis: Kirk didn't have any chunk plays like he did in his 90-yard coming-out party Week 3, but the Week 4 effort marked his second-best performance of the season. With a modest 7.45 yards per target and no touchdowns through four games, the 2018 second-round pick has nowhere to go but up as he continues to build a rapport with fellow rookie Josh Rosen. Kirk caught seven of eight targets for a career-high 90 yards in Sunday's 16-14 loss to the Bears. Kirk (back) doesn't have a designation for Sunday's game against the Bears, Scott Bordow of The Athletic reports. Analysis: Kirk made a sudden appearance on Thursday's injury report, the result of a car accident one day previous. After a limited session Thursday as he tended to a back injury, he didn't miss a single rep Friday, paving the way for active status Week 3. Kirk's target count increased from two in the season opener to five last weekend, but he's parlayed those looks into a meager five catches for 31 yards and no touchdowns to date. Kirk (back) returned to practice Friday, Josh Weinfuss of ESPN.com reports. Analysis: Kirk was held out of Thursday's practice after a car accident in which he was rear-ended by another driver. His quick return to the field suggests he should be fine for Sunday's game against the Bears. Kirk (back) didn't participate in Thursday's practice for precautionary reasons after he was involved in a car accident a day earlier, Bob McManaman of The Arizona Republic reports. Analysis: Kirk appeared on the injury report with a back issue, but he's apparently OK after being rear-ended in what was described as a hit-and-run incident. Despite the scare, Kirk seems on track to suit up Sunday against the Bears, though a return to practice Friday in some capacity would help clear up any lingering concern. Kirk worked with the training staff on a side field during the open portion of Thursday's practice, Kent Somers of The Arizona Republic reports. Analysis: A 2018 second-round pick, Kirk has made an impact, albeit small, in his first two games as a professional, corralling five of seven passes for 31 yards. The output is rather poor, but considering the offensive woes in Arizona, it's also not unexpected. What is worrisome is his sudden work with trainers, which implies an injury of some sort. Kirk's status will remain murky until Thursday's injury report is posted. Kirk hauled in four of five targets for 27 yards during Sunday's 34-0 loss to the Rams. Analysis: Is the glass half full or half empty in the desert for Kirk? On one hand, he was given more opportunities in Arizona's offense following a one-catch debut. On the other, that offense is dead last in the league in points and yards from scrimmage through two weeks. The Cardinals were barely ever a threat to score on the Rams on Sunday, and until they show signs of life, Kirk probably won't offer much from a fantasy perspective. Kirk corralled one of two passes for four yards in Sunday's 24-6 loss to the Redskins. Analysis: Opening his career as the No. 3 wide receiver behind Larry Fitzgerald and Chad Williams, the 2018 second-round pick didn't make much noise in this one. However, Kirk narrowly surpassed Williams' no catches (on three targets), so at least he has a reception to his name on the short season. Kirk will seek a better outing Sunday during a jaunt to take on the high-flying Rams. Kirk is listed behind Chad Williams on the Cardinals' initial depth chart, Kyle Odegard of the team's official site reports. Analysis: That said, Odegard adds that he'd "assume it will be a steady rotation" out of the gate of Williams, Kirk and J.J. Nelson alongside top wideout Larry Fitzgerald. Though Williams may technically be listed as a starter for now, Kirk's higher ADP reflects the upside the second-rounder brings to the table. Kirk caught four of six targets for 49 yards and a touchdown in Friday's preseason win over the Saints. 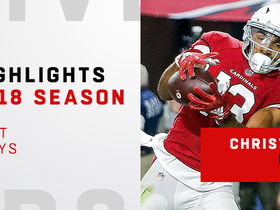 Kirk made his Cardinals debut during Saturday's preseason opener against the Chargers and caught two of three targets for nine yards. 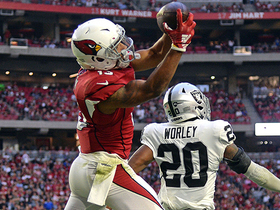 Analysis: While Kirk didn't make much of a contribution on offense, the rookie gave Cardinals fans plenty to be excited about after ripping off a 38-yard return on a punt he could've taken to the house had he not tripped in the open field. Kirk, who's worked with the first-team offense since the start of training camp, is competing for the No. 2 job at wideout behind the established Larry Fitzgerald. 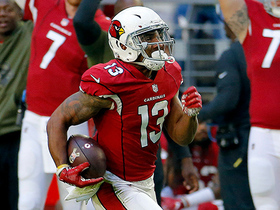 Watch the best plays from Arizona Cardinals wide receiver Christian Kirk's rookie season. 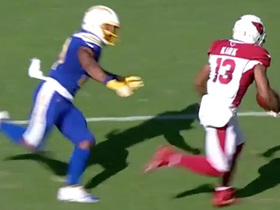 Arizona Cardinals quarterback Josh Rosen finds wide receiver Christian Kirk for a 37-yard gain. 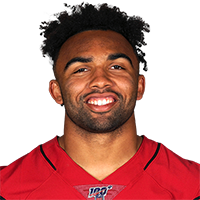 Arizona Cardinals wide receiver Christian Kirk makes an impressive punt return for a 26-yard gain against the Los Angeles Chargers in Week 12 of the 2018 season. 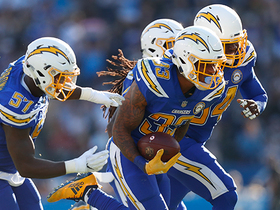 Los Angeles Chargers safety Derwin James intercepts Arizona Cardinals quarterback Josh Rosen’s pass. NFL Network Senior Fantasy Analyst Michael Fabiano lists his top 5 waiver wire additions for Week 12. 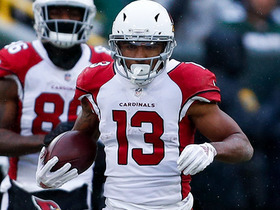 Arizona Cardinals wide receiver Christian Kirk makes an impressive third-down catch. 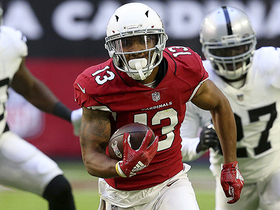 Arizona Cardinals wide receiver Christian Kirk rushes for a 59-yard touchdown against the Oakland Raiders. 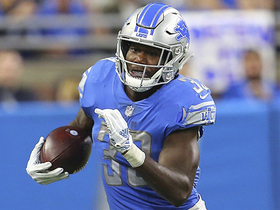 NFL Networks' Maurice Jones-Drew picks his top young players of the month in fantasy of the 2018 season. 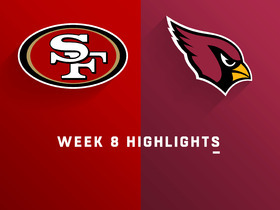 Watch the best plays from the Week 8 matchup between the San Francisco 49ers and Arizona Cardinals.